Finally found the shoes I was looking for….. I have spent at least 30 hours, yes, 30 hours looking for a pair of Hi-Tec sandals on the internet to replace the ones that are worn out! 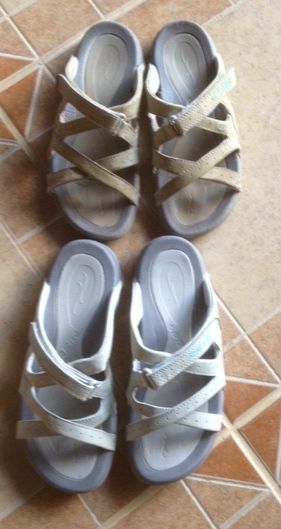 Apparently, no one, at any website that carries these type of sandals had a size 6 in stock. Went to town this morning and look what I found in the shoe store across from Casa Blanca! Made me such a happy camper….so I’m absolutely positive, these are the only size 6’s in the world! And I found them in little ole Costa Rica!!! And they were the same color as the old ones were…..Is this a great country or what? Pura Vida! Since we’ve lived here, WOW, almost three years ago, we’ve been getting emails about going to Beach Day. Finally, we went to one that was held at Pelicano Resort in Esterillos Este; an hour and a half to a two hour drive because of Saturday traffic. It was unbelievable!!! There were about 30 people that ventured there from San Ramon, Grecia and Atenas; and some people even brought their 4 legged friends! I love that the beaches are tree lined because believe me, that sun is HOT, HOT, HOT!!! Mark and I walked out to the water – it’s quite a ways because the tide was out. We were very happy we had on flip flops – the sand was unbelievably hot – as it came over the top of the flip flops, it burned your toes. A lady from Canada decided to walk to the water with NOTHING on her feet. As she got maybe 20 ft. from the shaded sand, she began to scream, it’s burning my feet, help me! A friend threw her some flip flops as she was headed back to the shade and she ignored those. So she kept walking and screaming. She kept screaming the skin is burning off my feet and was she ever right!!! I’m wondering if maybe she had neuropathy and it took awhile for her to realize the sand was burning her feet. She kept saying, “I’m from Canada and the sand doesn’t get that hot!” She actually had black spots on the bottom of her feet. The resort was bringing her bags of ice and cold water to hopefully help stop the pain….a worker there even picked an aloe plant, but she kept screaming, “it’s burning, it’s burning”. Come to find out ice is the worst thing to use, just tap water or cool water. The aloe didn’t even help her. Finally the ambulance came, Cruz Roja, and they were going to take her to some clinic, not sure where. There was also talk about taking her to the hospital in Grecia where she was either vacationing or living. At any rate, her vacation, if it was a vacation is ruined….last I heard she was trying to find a wheel chair, poor lady. Back to Beach Day…..they had a grill set up and cooked beach side or you could go to the restaurant and order lunch. We had a great day – but you know after you’ve been to the beach, there’s just something that makes you exhausted! I took a nap after we got home late afternoon! I will also be shopping for beach chairs to take to the next one!!! What’s really nice is there are people there if you want to talk, if you want to read everyone respects that…..it was just a nice day!!! Can’t wait till the next one! 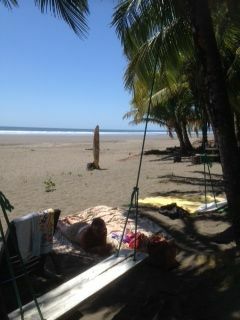 Pura Vida…..and remember, at least flip flops are needed when you’re walking at the beach!!! We celebrated Valentine’s Day with friends Mike and Joni, Pat and John, and of course Mark and I. 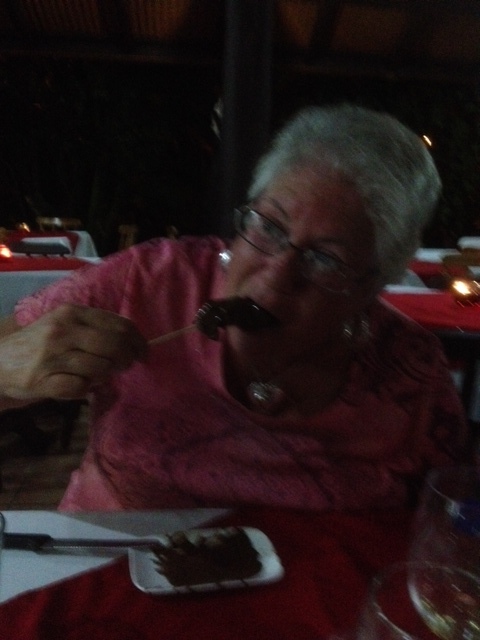 We had dinner reservations at LaTrocha……because Joni discovered they were having a chocolate fountain for dessert. 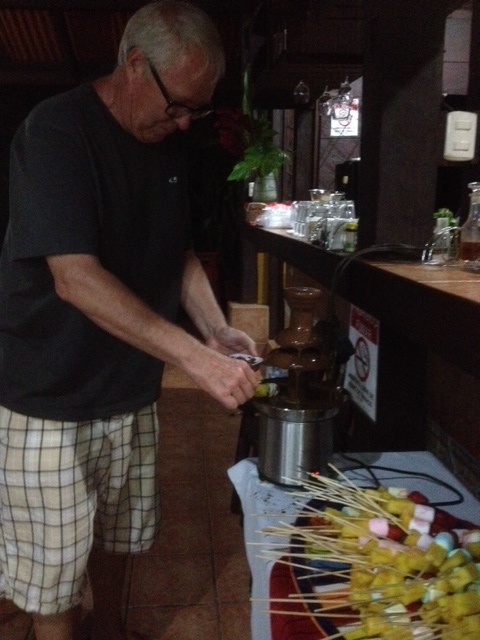 Chocolate, which has been confirmed as a health food, and skewers of fruit, well, with one marshmallow, which probably isn’t the healthiest of foods…..let’s just say we took a vote and it was decided it was a healthy dessert! For the most part, everyone was pleased with their food and the dessert. We had ordered our food and someone at our table was quite concerned that the fountain wasn’t flowing yet. I will not divulge that name! 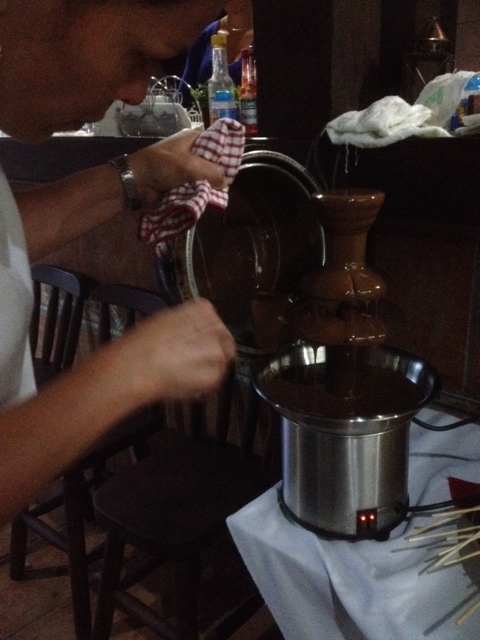 Soon after the “panic”, the fountain was flowing with yummy HEALTHFUL chocolate. Mark couldn’t wait to try out the chocolate and immediately took a turn. 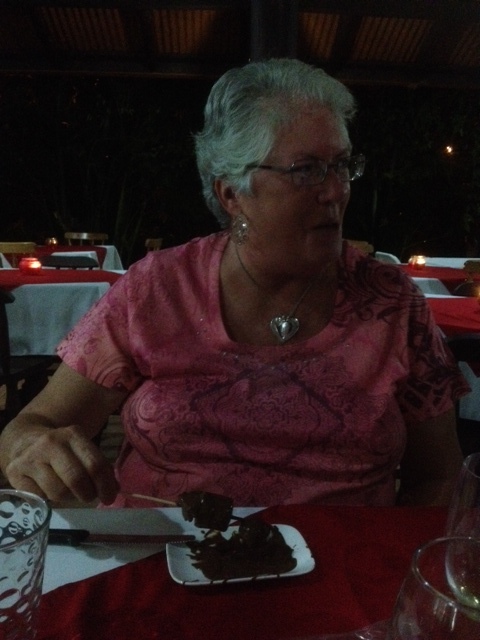 Joni was debating which skewer of mostly fruit to start with….she has what most people would call a “decision making disorder”. At last the decision was made! YUM! YUM! YUM! 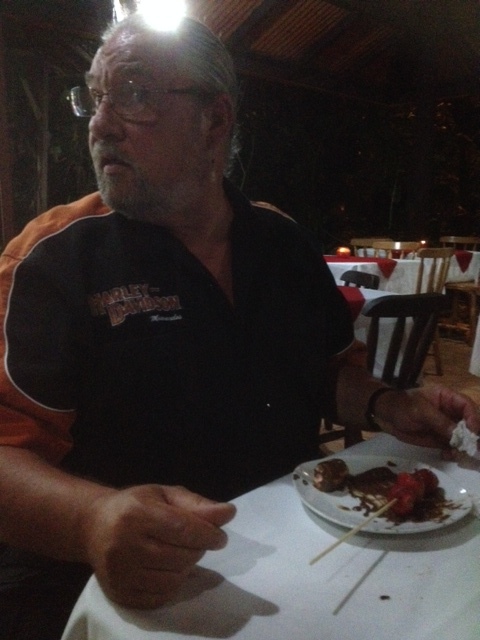 Mike thought if he didn’t look at the plate of skewers, he wouldn’t be eating them…..but I can assure you he’s “busted”. 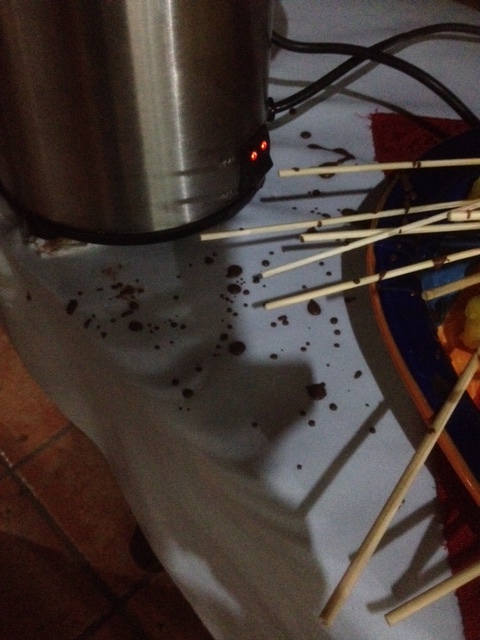 And this is what the tablecloth looked like after 6 gringos were done! It was a really nice evening with good friends and good times. It’s what I would call a nice little fiesta! Pura Vida from Costa Rica – the pool is calling my name!